There are approximately 135 “weekend” days a year, counting friday/saturday/sunday. If you are to consume an additional 300 calories (only 300!) on those days (a large dessert, 1 meal out, 2 drinks, etc) that is 12 pounds per year! You may not be the extreme weekender, but if you are any version of this, much of your hard work during the week is being voided on the weekends. Or look at it this way- the reason you have not gained 12lbs, but maybe 3-5, is because you counteract the gain with your good weekdays. How can you get on the good side of this? Is that extra drink worth it? Evaluate the evening…we all know, some nights are worth the extra drink and some are not. Re-create your favorite meals from restaurants at home on the weekends- saves money and calories! Get excited about your extra time you have to devote to being healthy- plan ahead! Try not to eat out more than 1x per weekend day. They say a meal out contains an extra 250+ calories no matter what you order! Practice the same clean eating habits on the weekend- try getting 75% of it right and give yourself a break on the other 25% of your day! Flush out extra sodium and sugar with WATER! Remember, you deserve a cheat now and again…just don’t do it all in one day! Don’t overdo it on Monday to make up for a bad weekend….instead, plan ahead and don’t let the bad weekend happen! Let me know if you have any questions, and always count on great websites (www.thewholetulip.blogspot.com, http://www.cleaneatingmag.com, http://www.wholeliving.com) for advice, recipes- and staying healthy! Thought we needed one of these- its been a while! legs straight put hands on ground. walk hands out to plank without bending knees- or try not to bend knees. once in plank do push up, walk hands back to feet- legs still straight, stand up. Repeat! I know…2 in one day! I got excited! This is a pretty tough one, especially if you pick your true “goal” pace for these distances. I included a pace calculator for the treadmill below, starting with a 10 min mile, but please feel free to pick different paces than what I provided. Treadmill will tell you pace– I listed for those of you who may want to pre-plan when you print this out! If you want a shorter run, shorten the warm up and take out the 3rd set. Strength Train, Treadmill Workout…all in one post! Congrats to Shelley B from Charlotte NC- she won the drawing for the $25 spa finder gift card :) Thanks for your feed back and congrats! It will be sent to your email shortly. One song per muscle group. Choose your favorite and work that muscle group to fatigue until the song is over! Here is the order of muscle groups that makes most sense (opposing muscles, making sure you are warmed up etc) and some ideas for music. You can go different speeds within the song, do different variations of the exercise listed, some ideas below. Let me know what you think!! after 2x, .50 easy! 4.5 miles total! Iron Mamas- for kids too! 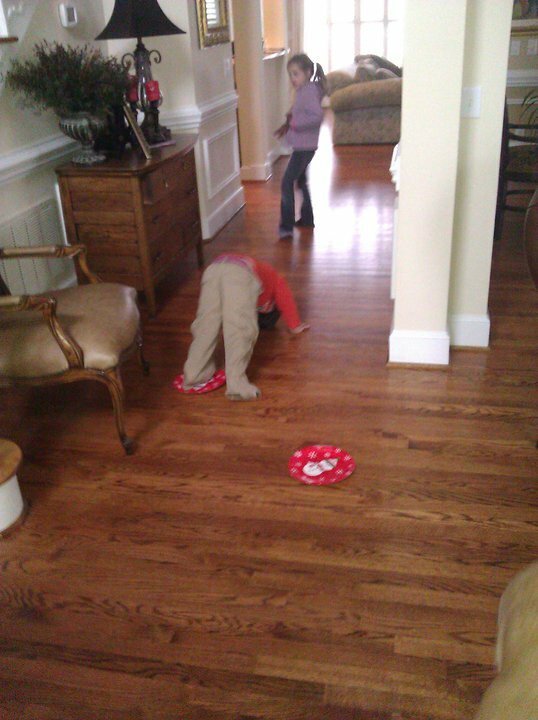 Check out Iron Mama, Dee Dee’s son- who said the paper plate gliders weren’t for kids too?! Very nice pike!